Leptospermum scoparium, commonly called mānuka, manuka, manuka myrtle, New Zealand teatree, broom tea-tree, or just tea tree, is a species of flowering plant in the myrtle family Myrtaceae, native to Australia and New Zealand. It is a prolific scrub-type tree and is often one of the first species to regenerate on cleared land. It is typically a shrub growing to 2–5 m (7–16 ft) tall, but can grow into a moderately sized tree, up to 15 m (49 ft) or so in height. It is evergreen, with dense branching and small leaves 7–20 mm long and 2–6 mm broad, with a short spine tip. The flowers are white, occasionally pink, 8–15 mm (rarely up to 25 mm) in diameter, with five petals. The wood is tough and hard. This species is often confused with the related species kānuka (Kunzea ericoides) – the easiest way to tell the difference between the two species in the field is to feel their foliage – mānuka leaves are prickly, while kānuka leaves are soft. Alternatively, the seed capsules of mānuka are large (5-7mm in diameter) and often remain on the plant year round, whereas the seed capsules of kānuka are much smaller (2.2-4.6mm in diameter) and are not present for much of the year. The Latin specific epithet scoparium means “like broom”, referring to Northern Hemisphere genera such as Genista and Cytisus which it superficially resembles, but to which it is only distantly related. Evidence suggests that L. scoparium originated in Australia before the onset of the Miocene aridity, and dispersed relatively recently from eastern Australia to New Zealand. It has been postulated that on arrival in New Zealand, L. scoparium became established in limited edaphically suitable areas until the arrival of the Polynesian people, whose fire and forest-clearing brought about the low-nutrient-status soils for which it was preadapted in its homeland. It is now more common in New Zealand than it is in Australia. It is found throughout New Zealand, but is particularly common on the drier east coasts of the North and South Islands, and in Australia in Tasmania, Victoria and New South Wales. The adult mānuka beetle (Pyronota festiva) and its larvae feed on L. scoparium in New Zealand. Tea tree, mānuka and kāhikatoa are common names for this species. "Jelly bush" is also used in Australia to describe similar honey from Leptospermum polygalifolium. Tea tree arose because Captain Cook used the leaves to make a 'tea' drink. Mānuka is a Māori word from New Zealand. Many more cultivars are available in New Zealand but often the plant performs better in cultivation overseas. This is because in its homeland it is subject to attack by scale insects that secrete a honeydew on which grows a sooty mold that eventually debilitates the plant. Because of this, attempts have been made, with limited commercial success, to cross the showy New Zealand cultivars with mold-resistant Australian Leptospermum species. The wood was often used for tool handles. Mānuka sawdust imparts a delicious flavour when used for smoking meats and fish. It is cultivated in New Zealand for mānuka honey, produced when honeybees gather the nectar from its flowers, and for the pharmaceutical industry. It is also used for carving. An essential oil, for which many medicinal claims are made, is produced by steam distillation of its leaves. Manuka, as it is called by most New Zealanders, was used in pre-European times by Maori, and still is. A decoction of the leaves was drunk for urinary complaints and as a febrifuge (an agent for reducing fever). The steam from leaves boiled in water was inhaled for head colds. A decoction was prepared from the leaves and bark and the warm liquid was rubbed on stiff muscles and aching joints. The emollient white gum, called pai Manuka, was given to nursing babies and also used to treat scalds and burns. Chewing the bark is said to have a relaxing effect and it enhances sleep. Kakariki parakeets (Cyanoramphus) use the leaves and bark of mānuka and kānuka to rid themselves of parasites. Apart from ingesting the material, they also chew it, mix it with preen gland oil and apply it to their feathers. Manuka, Australian Capital Territory, which, although it is pronounced differently, was indirectly named after the New Zealand tree. Tea plants (Camellia sinensis) are also grown commercially in New Zealand. ^ a b c "Leptospermum scoparium". Germplasm Resources Information Network (GRIN). Agricultural Research Service (ARS), United States Department of Agriculture (USDA). Retrieved 15 December 2017. ^ a b Derraik, José G. B. (2008). "New Zealand manuka (Leptospermum scoparium; Myrtaceae): a brief account of its natural history and human perceptions" (PDF). New Zealand Garden Journal. 11 (2): 4–8. Retrieved 2 May 2016. ^ "Leptospermum scoparium var. scoparium | New Zealand Plant Conservation Network". m.nzpcn.org.nz. Retrieved 2018-09-07. ^ "Kunzea robusta | New Zealand Plant Conservation Network". m.nzpcn.org.nz. Retrieved 2018-09-07. ^ "Shrublands guide" (PDF). Auckland Council. Auckland Council. Retrieved 2 May 2016. ^ "Mānuka/kāhikatoa and kānuka". New Zealand Government - Te Wānanga o Aotearoa Department of the Environment. Retrieved 7 July 2017. ^ "mānuka - Māori Dictionary". Maori Dictionary. Retrieved 2018-01-12. ^ "AGM Plants - Ornamental" (PDF). Royal Horticultural Society. July 2017. p. 59. Retrieved 21 March 2018. ^ "RHS Plant Selector - Leptospermum scoparium 'Kiwi'". Retrieved 21 May 2013. ^ "RHS Plant Selector - Leptospermum scoparium 'Nichollsii Nanum'". Retrieved 21 May 2013. 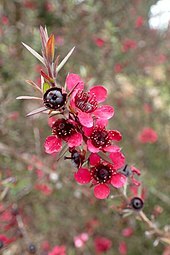 ^ "RHS Plant Selector - Leptospermum scoparium 'Red Damask'". Retrieved 21 May 2013. ^ "RHS Plant Selector - Leptospermum scoparium 'Silver Sheen'". Retrieved 21 May 2013. ^ "1999 RNZIH Conference Report". Retrieved 5 December 2013. Wikimedia Commons has media related to Leptospermum scoparium.